As I’ve written about before, Rosebud and I love to read. I often buy her new books based on the season and or if there’s a holiday coming up. For the spring, I get out her books about birds, plants and baby animals. In the fall, we read books about pumpkins, leaves and of course Halloween. The winter is no exception. The books we are reading right now are related to snow, Christmas and her birthday coming around the corner. As I’ve mentioned in other posts, I’m visually impaired so I don’t see the pictures very well. In children’s books, one could argue that the pictures are the most important thing. Well, they are to the child at least. Since I can’t see all the little details, I love to find books that are more interactive. Not only does it help me, but these extra elements make reading more fun for the children. 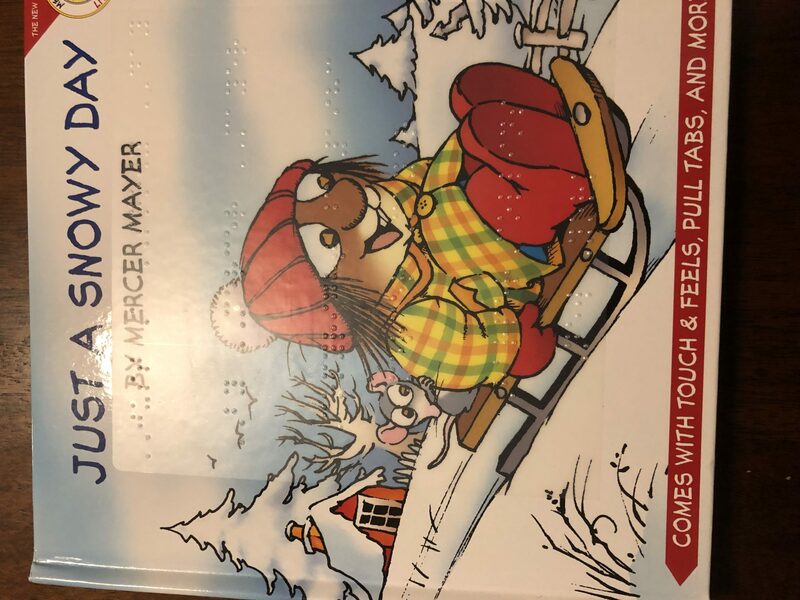 Here are some great interactive winter books I’ve found along the way. 1. That’s Not My Snowman by Fiona Watt. 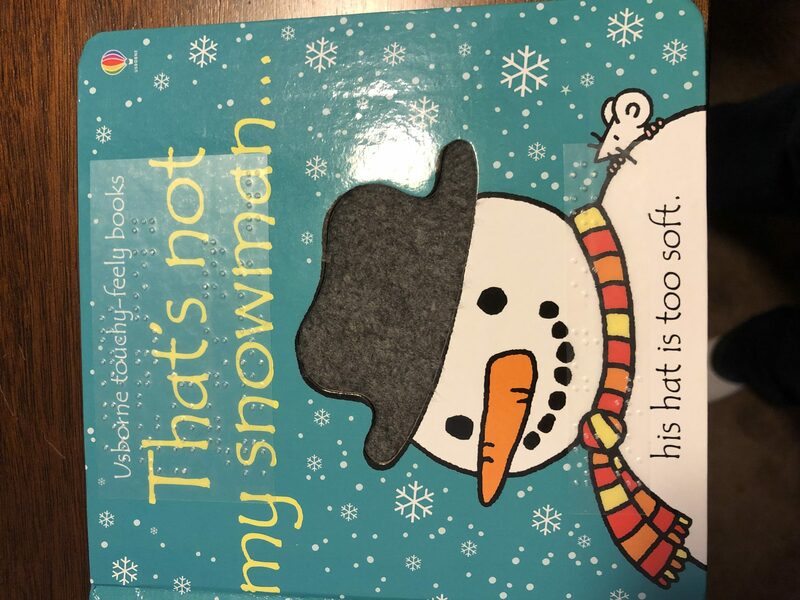 This book shows a snowman on each page with a different tactile element. the mittens are too fuzzy or the buttons are too bumpy. The book is short, but it’s great for infants and toddlers. Rosebud still loves this book. 2. 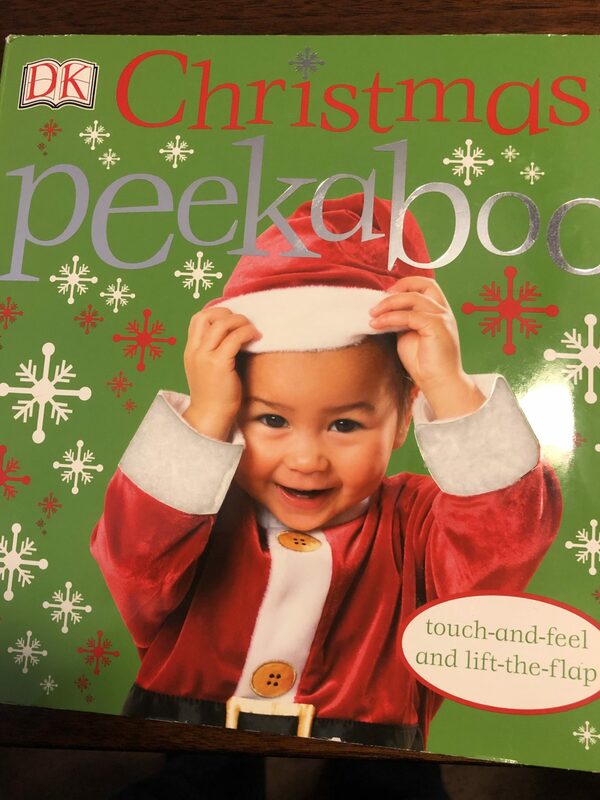 PeekaBoo Christmas! : Touch-and-Feel and Lift-the-Flap by DK Publishing. This book is large, sturdy and has illustrations that are shiny and colorful. Some of the pages include touch and feel elements like the pompom on the hat or the ornaments on the tree. Kids love to lift the flap to see what’s inside. Rosebud has always loved the different peekaboo books and this one did not disappoint her. 3. Little Critter:Just a Snowy Day by Mercer Mayer. I bought this book many years ago to read to the kids I was working with at the time. Now I get to share it with Rosebud. I love all the interactive elements in this book. You get to spin a wheel to make it snow, smell a cup of hot chocolate and pull Little Critter’s sled. My only complaint about this book is that the pull tabs can be easily broken. This book has always been a hit with any of the children I’ve read it to. The book is now out of print, but you can still find it on Amazon. 4. 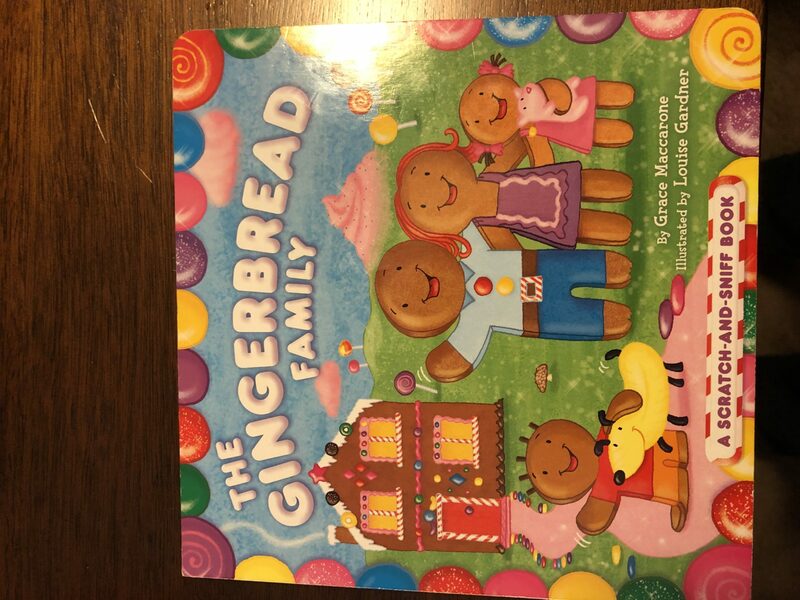 The Gingerbread Family: A Scratch-and-Sniff Book by Grace Maccarone. 5. 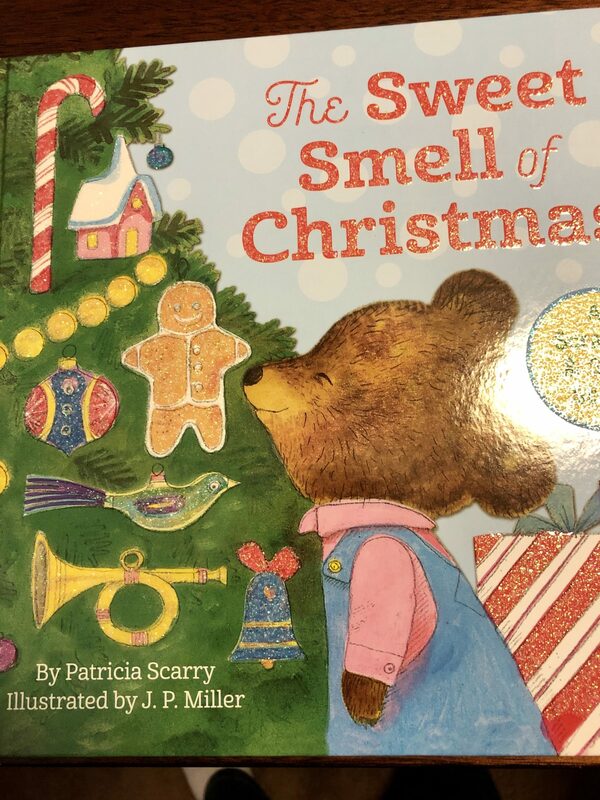 The Sweet Smell of Christmas (Scented Story Book) by Patricia M. Scarry. Many people seem to remember this book from their childhood. I do not and I have not read it to Rosebud yet. It will be a stocking stuffer for her this year. This book is filled with scratch and sniff stickers and I know Rosebud will be excited to read this one. What are your favorite winter and holiday books? Let me know in the comments. Great post. I love book lists! I will be doing some more book lists in the future. Thanks for commenting. I should get more of those books. I’m sure she’d like them. Thanks for your comment. Love interactive books that get the kiddos involved! We have many books with flaps to lift and textures to feel but I’ve never read one before that was a scratch and sniff! What fun! Thanks for sharing! Thank you for your comment. Scratch and sniff is fun! The only draw back is usually the scents don’t last long unless they are strong to begin with. the stickers are fun too.